Welcome! I have been Dr. Jensen's assistant assistant since July of 2013. I enjoy helping you feel comfortable during your procedure, and I like being able to provide information and education so you understand what is going to happen during your appointment. I love working here due to the wonderful atmosphere--relaxed but still professional. I grew up in Sandy and Gearhart Oregon. When not at the office I enjoy hiking all over Oregon and playing gigs around town in my band Kelsey Brie. I have been Dr. Jensen's front desk coordinator since October 2015. I manage all of the scheduling,billing and insurance in the office. I really enjoy working with people and helping them understand their insurance benefits. When I am not at the office I am taking classes at PCC for my nursing pre-requisites. I grew up in eastern Washington with my family and have 2 sisters. I love living here in Portland and enjoy experiencing all of the different foods that the city has to offer. I have a dog named Henry who is a Dorkinese (Yorkie, Daschund, Pekingese). 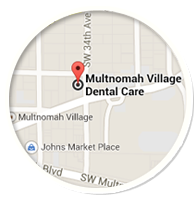 I have been with Multnomah Village Dental since 2011. I started out as a dental assistant with Dr. Shaw( previous owner) and Dr. Jensen. In 2015 I graduated from Pacific University with a degree in Dental Hygiene and returned to Dr. Jensen's office as a dental hygienist. I grew up on the Southern Oregon coast in a family with 5 kids, so I like being a part of a group. The staff here is like a family to me, so I feel right at home. The patients who come here are really nice, and I am enjoying getting acquainted with each and every one of you. I came to Portland in order to go to school to become a Dental Hygienist. I am studying the prerequisites, and look forward to growing into the profession. So far, I am really happy in Portland because I can easily pursue my interests of photography and rock climbing. I have a dog named "Monkey", who literally keeps me on my toes. I started working at Multnomah Village Dental in 2008 as a dental assistant. In 2012 I moved to the front desk and began taking pre-requisites for dental hygiene. I was accepted to the PCC dental hygiene program and graduated in July 2016. I am dedicated to making patients feel comfortable and at ease during their appointments. I grew up in California, in the Mojave desert. While I love Portland, I miss the warmth and sunshine. My husband and I try to get out as much as possible, we like goint to Blazers games and attending differnt festivals around town. We also love spending time with our minature pinscher Blair.